Mark Langfan's appearance on CBN explaining strategic danger of 'Two-state solution' a viral sensation, with 500,000 views. 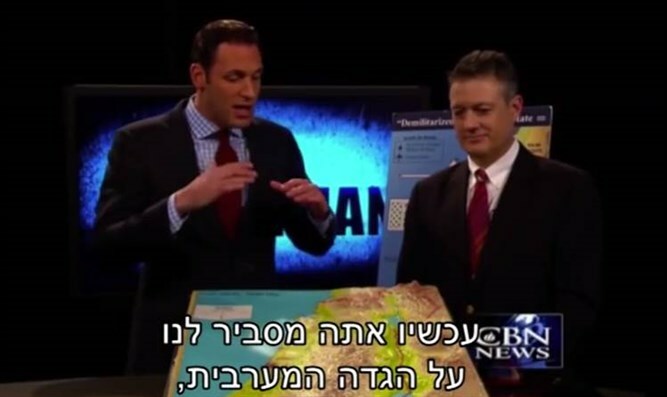 A 5.5-minute video in which Middle East strategy analyst Mark Langfan explains the dangers on the "two state solution" has become a viral hit in Israel, more than three years after it originally aired on CBN. After being featured in November on a Facebook page created by grassroots Zionist activists called Kol Ha'am ("The People's Voice"), the Hebrew-subtitled clip has garnered 367,000 views to date, which – combined with its views elsewhere on social media, puts it at a total of about 500,000 total views, most of them from Israelis. In terms of views per population, this would be the equivalent of 33 million views for a video targeting the US audience. It is currently shooting up at over 20,000 views per day. In the video, Langfan, a New York-based attorney, pro-Israel activist and media analyst appears on Erick Stakelbeck's show, "The Watchman", to clarify what could – and probably would – happen, if Israel were ever to allow Palestinian statehood in Judea and Samaria. Using a three dimensional map of Israel, a few pieces of colored Plexiglas and a lot of old-fashioned common sense – Langfan demonstrates the ease with which Arab control of the mountainous Biblical heartland would place 70% of Israel's Jewish populace and 80% of its industrial base within the range of truck-based chemical weapons of mass destruction. The clip's success runs counter to commonly held views on social media marketing, according to which the short attention span of the modern audience prescribes that only extremely short and fast-moving videos stand a chance of success. To the contrary, it seems that the Israeli audience appreciates precisely the in-depth, low-snazz analysis that Langfan provides. Some of viewers' reactions – most of which seem to be from people in their 20s and 30s – compliment the video for showing what Israel's left-leaning educational system and media do not, and for providing a solid, fact-based rationale for rejecting the "two-state solution" that has been accepted by Israel's leadership. The video featured on Facebook is a shortened version of the nine-minute segment on Langfan's Youtube account. Langfan chairs Americans for a Safe Israel and is a regular contributor to Arutz Sheva.